U.S. Senator - TERRY ADAMS, Terry Adams, as I noted earlier, speaks my language and understands that we have to develop a new progressive vision for Tennessee, and that what worked in 1992 no longer works in Tennessee. Gordon Ball has lots of money, but he takes positions that are to the right of what a successful Democratic candidate should have. I back Terry Adams, and I hope that you do as well. U.S Representative, 9th District, Isaac Richmond. JUST KIDDING! Steve Cohen is the best Congressman we have had since Harold Ford, Senior, and sometimes even better. He works tirelessly on behalf of his constituency, providing great constituent service and votes EXACTLY the way I would vote if I were the Congressman. What more can you ask? Oh, and he brings home Federal money for the institutions of the 9th District. Where Ricky Wilkins will have difficulties has nothing to do with him personally. There is no rising groundswell to replace Cohen, except in the minds of some members of the political class who can't accept that a majority of African-American voters have repeatedly chosen a person of non-color to represent them. Ultimately, the first question in a Congressional primary with an incumbent is this: Are you satisfied with the representation you have received? If the answer is yes, then the rest of it is moot. If Wilkins can't get enough people to reconsider a decision they have made several times before, then he has little chance. This is why he has no choice except to attack Cohen, which will make the summer quite interesting. Governor - John McKamey. The former Sullivan County Mayor decided to run earlier this year, and I got to hear him speak at the Germantown Democratic Club, and I liked what I heard. He faces a decidedly uphill battle against the incumbent, Bill Haslam, of the Pilot/Flying J Haslams. State Senate, District 31 - No one bothered to file against The StuntBaby of Germantown, so I will write in someone, suggestions may go in comments. State House, District 90 - A long, long time ago in a far away land, there was a state representative that I admired for his integrity, and supported him when he ran for the State Senate against Ophelia Ford. He fundraised little, and while I didn't agree with him on social issues, we were in lockstep on financial issues. Somewhere along the way, John DeBerry found that the forces working to kill public education in Tennessee were only too happy to fund his campaign against Jeanne Richardson, and all of a sudden these newfound buddies were only happy to buy ads for him. DURING THE 2012 SUMMER OLYMPICS. That, of course, was the end of Jeanne's legislative career, and another progressive voice was silenced by money. So, as a protest, I am, for the foreseeable future, writing in Jeanne Richardson's name for House 90. I know I will sleep better for having done so. Democratic State Executive Committee, District 31, Male - Dwayne Thompson, for whom I first knocked on doors back in 1978, and will do again later this year as he also attempts to unseat Rep. Steve McManus (R-Cordova). I trust him, and it doesn't hurt that he actually LIVES in Senate 31. State Senate, District 29 - Lee Harris. The City Councilor and UM Law professor is the best choice to involuntarily replace Senator Ophelia Ford, who, putting it as charitably as possible, is not of sound enough health to continue serving in the legislature. Even giving her the best of it, she no longer needs to serve in Nashville, as she has not proven that she can physically perform her duties. I like Ricky Dixon but I believe Lee Harris is the best fit for the district that contains South Memphis, Downtown and Cooper-Young. State House, District 84 - Joe Towns. If it ain't broke, don't fix it. State House, District 91 - Raumesh Akbari. She has been a great fit for the district, falling in the footsteps of the late, magnificent Lois DeBerry. She deserves a chance to continue her solid representation of District 91. I believe in more youth moving into positions of service, so I am supporting Corey Strong for the District 33 male position on the State Executive Committee and London Lamar for the female position in that District. Have I missed anything? No, I didn't think so. 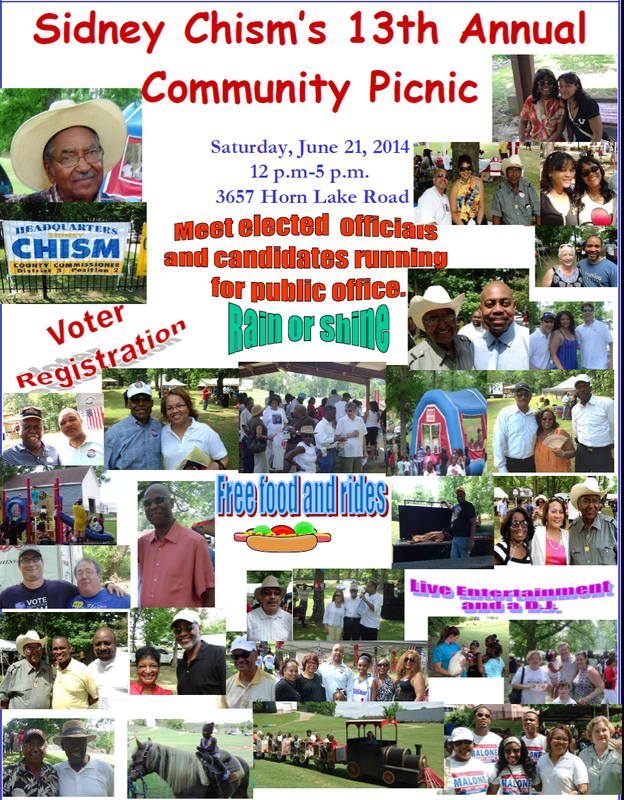 Sidney Chism Picnic THIS Saturday! This was going to be the year Democrats won Shelby County. It still is, but it used to be, too. Right now, there is little reason to think that election night 2014 is going to be any kind of celebration for Shelby County Democrats. So far this election season we've had three arrests, an utter debacle over judicial endorsements, and an angry, racially-charged outburst that comes fresh on the heels of a long, contentious fight over the school system that divided the county largely along racial lines. We also have a chronically absent state senator who is most notable for her own venomous outburst against the state's nurses. This dismal state of affairs is nothing new. After long years of scandals, indictments, federal investigations, and simple bad behavior, political shame and embarrassment have become as familiar to us as August humidity and Elvis Presley. We've grown used to it. There is a powerful sense in the air that this is just the way things are in Memphis and Shelby County, and that this is the way things are always going to be for the foreseeable future. We are mired in a swamp of political depression. There is, however, a light at the end of this particular tunnel. When I worked in Steve Cohen's office in Washington, DC, the GOP had just taken control of the House the year previous and I had an opportunity to see what a functioning Democratic Party looks like while under siege. I had a front row seat to Anthony Weiner's resignation, and as an intern I even helped his staff clean out his office. As the congressman's press assistant, I received all House Democratic press releases and talking points and learned the various ways the Minority Leader keeps her members in line and on message. As a member of his staff I got to see firsthand how a truly skilled politician behaves and treats his constituents, and as part of his political team I learned how it is possible to consistently run up the electoral scoreboard in victories that make the word "landslide" seem like an understatement. All of the problems which currently plague the SCDP have a solution, and it is the national party, not the state party, to which we must look for examples. Shelby County is the largest Democratic stronghold in Tennessee. It is well within our power to become the most dominant force in state politics. We once were, and we will be again. We have to, we don't have any other choice if we want to move forward. Like it or not, Shelby County is attached at the hip to Memphis, and we will never help disadvantaged Memphians rise out of poverty if we can't even get them access to Medicaid, if HOPE scholarships get raided for the governor's pet projects, or if our attempts to reform the school system are undermined at every step. We can't just clean our house, that's not going to be good enough. We have got to elect more Democrats who can lead by example, who can influence their peers on difficult issues, and who will make Democratic voters across the state feel a sense of pride by dint of mere association. This is all within our power to do. The very first step we can make in that direction is helping Lee Harris in his challenge to Ophelia Ford. That election will likely be decided by fewer than 2,000 votes and Senate District 29 desperately needs better representation in Nashville. This simple, small victory will go a long way toward reforming our image in the state capital and will put forward someone we can be proud of. The next step should be making the party machinery more useful to candidates and elected officials so that we can all be on the same page and maintain some degree of party discipline. The SCDP should take an official position on every issue within its scope. That does not mean all Shelby County Democrats must take those same positions, but it is immensely important that the party communicates to its members the official party position on all local problems which have a political solution. That leaves room for individual innovation among its elected members while informing those same innovators about how they should maneuver relative to the party. The county party must develop its own fundraising apparatus. Noble attempts have been made at this in the past, and they must be attempted again. The party needs a carrot. We must also agree upon a credible party leader who can not only speak for the party, but who is enabled to credibly publicly condemn bad behavior among Democrats in the media. The party needs a stick. Ideally this would be someone who does not have any outstanding arrest warrants themselves. Finally, we need to create a career track for our local Democratic activists. Speaking from long personal experience, politics is both a full-time job and a terrible way to try to make a living. Campaign work is seasonal, and there is no more certain way to certify yourself as "overqualified" for non-political work than to work on campaigns and in Congress. Republicans have ways to take care of their people. We do not. I don't care if we have to start a Democratic landscaping company that rakes the leaves, trims the hedges, and cuts the grass, we need some way for professional Democratic activists to support themselves between elections. This is the pool of people from which we are going to pull our best candidates, party leaders, and campaign staff. Those people need to pay their bills. Liz Rincon and London Lamar can't do it all by themselves. We need more Democrats who are trying to do what they are doing, and we need to support them. No matter how the county elections turn out, this is not going to be a banner year for Shelby County Democrats. Rather than focusing on the outcome of the elections themselves, let's turn our attention instead to how they are won and lost, and center our efforts on making sure that the process of Democratic victory becomes the status quo in Shelby County. What the hell, Commissioner Brooks? It's one thing to alienate potential supporters when trying to make an otherwise valid point about the awarding of county contracts, but THIS? Really? As I have noted before, you are due great praise for your efforts to force necessary change upon Shelby County Juvenile Court, which resulted in the intercession by the US Department of Justice. I understand that you wish to continue this change with your election to the Juvenile Court Clerk position. How, then, are we supposed to approach potential undecided voters when you, well, keep acting a fool in public? Threatening someone over a PARKING SPOT?? Really? It's going to be hard enough to get Democrats to vote for you when this kind of thing happens, much less independents or Republicans. This incident pretty much ends your chances of winning, and we NEEDED you to win. This, frankly, hurts the whole ticket, but I doubt you thought of that. Commissioner Brooks, you have been a dedicated public servant during your years in the General Assembly and on the County Commission, but events like this are going to prevent you from serving in the future. Sure, there will be some folks voting for you simply because there's a D next to your name, but not enough of them to win this race. This is the sort of thing that makes the Democrats in Shelby County look like laughingstocks, and it just can't be tolerated any more. I really don't know what else to say here. Who runs the Shelby County Democratic Party? Jay Bailey and others were angry over the party deciding to endorse some candidates that they did not like, re: Lee Coffee, going by my reading of the list of people that they declared "Non Bona Fide," so last night they had a meeting of the Shelby County Democratic Primary Board and declared a whole bunch of people with "Republican and conservative voting records" so. Jay goes on to say that this was done to counteract the rookie mistake (I assume by Bryan Carson) and others to have endorsements so there can be no endorsements by the party of such individuals that are declared as such. Thus the title of this post. Why did Javier do this? I don't know. I think he believes that he controls the party apparently. Why else would we have this farce that even Dell Gill would object to AFTER we already had the endoresements? The time to do this is before the endorsements occurred, not after. By doing it when he did, Javier makes a mockery of the party and our procedures (not that we don't try hard enough on our own to do this) attempting to circumvent the process. The self congratulating notes in the press release make it even better. "The infiltration of local Democratic leadership has now been countered. ", "rookie move that was made last Thursday night", and my favorite, "Those of us who have been developing and implementing campaign strategy for over 30 years." All of these scream of an individual who believes his own hype and deluding himself into thinking he is the guardian of the party. Stop with the grandstanding and cheap shots and come together to make the party stronger. I wasn't happy with the party's decision as well, we endorsed a known homophobe in one race for example, but I won't make a proposal that we change the endorsements based on that. Your actions do not help us, they only hurt us, making the party look weak and incompetent. I will close with this, going by your standard, if Ball wins the nomination, you would have him declared non bona fide as he campaigned and voted for Haslem and Charlie Crist, who hopefully will win Florida, would have the same as he was once a Republican. I know what you're going to say after reading the headline; put the pipe down, Cracker. You may say it's crazy (and of course, the GOP will deny this so fast it will make your head spin), but hear me out. LAMAR! will turn 74 years old on July 3, which means that if he were to be A) re-elected and B) serve out a full term, he would be 80 years old at the end of that term. Sure, he looks to be in good shape, but does anything he's done in the last few years make you think that he is ENJOYING what he's doing? He left GOP Senate leadership because he was tired of dealing with the Tea Party wing of the GOP, watching them cost the GOP Senate seats around the country. That's one reason he is running this year, to crush Joe Carr, who has gotten NO traction whatsoever. Maybe if the Club For Growth thought Carr had a chance to knock off Alexander, they would have gotten behind Carr. They haven't, and Alexander will cruise to victory in the GOP Primary on August 7. Especially if the GOP can't capture the Senate in November, it's really hard to see why LAMAR! would want to stay in Washington if he can't get anything done. So, why did he run? To have a say in who replaces him, that's why. Haslam, with his gazillions, is considered to be a prohibitive favorite for re-election in November simply based on money and the fact that most Democrats seem to be waiting for 2018 when the seat will be open again (coughKarlDeancough). Haslam, too, is tired of dealing with the crazies in his party in Nashville, and would like to move up sooner rather than later. It's true, he could wait until the end of a 2nd term, when many think he and Senator Bob Corker will attempt to swap seats; Corker has had his eyes on the Mansion for a while, I hear. Let's follow this to its logical conclusion. Alexander runs for and obtains re-election, and announces in the middle of 2015 that, for private and family reasons, he has decided to resign his seat. A day or two later, Bill Haslam announces that he wants that seat, will resign as Governor and newly-ascendant GOVERNOR Ron Ramsey appoints his benefactor as the new US Senator. So what if Haslam has to run in a 2016 Special Election? Do you think Jim Cooper would challenge him? Who on our side of the aisle could raise enough to do that? And Tennessee is left with ole Bootsy himself to officially run the state he has been UN-officially running since he became Lt. Governor. Rather a frightening thought, eh? I think so too. Which is why the Democratic primary for the U.S. Senate now takes on a more important light. The three people in the race are Nashville's Larry Crim (who couldn't even fend off Mark Clayton two years ago), and two men from Knoxville, attorney Terry Adams and attorney Gordon Ball. I have heard both speak, but like better what I am hearing from Terry Adams. Adams is younger, more energetic, FAR more progressive, and seems to have a better plan for winning a ground game than does Ball. Ball did well to hire Kemba Ford as a front person for his Shelby County campaign; she has been everywhere representing him. He also seems to have gotten a lot of the SCDP helping him, by promising to help Shelby Democrats in the fall. That, of course, is not a bad thing at all, until you realize that there is only ONE legislative seat in Big Shelby that COULD change hands; that would be House 96, where my political godfather, Dwayne Thompson, is challenging Steve McManus. Ball, while a nice guy, has given more money at the national level to Democrats, has also given more money at the STATE level to the GOP. Six years ago, Ball endorsed the fellow he is challenging now, and was a DEMOCRAT FOR HASLAM in 2010. Ball has also stated that he supports a 15% FLAT TAX, which he has tried to back away from and dance around. Since I always tend to back the Progressives, I am supporting Terry Adams for this race, you can find him online here, and on Facebook here. When it's a Democratic primary, I support the person who speaks my language, and that's why I like Terry Adams. It doesn't matter to me how much money Ball happens to have, it's about what they are likely to do when they get to DC. Every thing that I have seen from both men leads me to support Terry Adams, and I hope that you will, as well. As a Democrat, I would support Ball in the event he wins the primary. As a private citizen, I intend to see that that doesn't happen and that Terry Adams is nominated and then ELECTED to the United States Senate. Of course, if you LIKE the idea of Senator Bill Haslam and Governor Ron Ramsey, you can vote for Lamar Alexander's re-election, if you choose. However, I suspect that, if you liked that idea, you probably wouldn't be reading this blog. Friends, Memphians, Democrats. Lend me your ears, I have come to bury the judicial nominee decisions, not to praise them. The evil that we did that night will live after us, there was precious little good that will be buried with the bones of the upcoming campaign season. Thursday night as I sat in the front row of the SCDP judicial meeting, I was struck by the sheer absurdity of the theater that I was witnessing. Backbiting, mud-slinging, lying, and deceit were slung around in a capricious manner. I blame the provincialism and outright not paying attention of many of my fellow Exec Com members in many cases affecting their judgement. This was evident from the start when the gentleman who was in charge of the Primary Board was peppered with questions about recommendations despite his repeatedly saying they only passed on the information of rather they passed the test of what primaries they had voted in. This is sadly funny in that most incumbent judges do not vote in primaries for this very reason. The process for endorsing was immediately thrown in to disarray by Felicia Corbin Johnson attacking Julie Byrd and causing the process to be completely changed from what we had originally agreed upon in May. The original plan was for if multiple candidate were deemed worthy, then they would be accepted and both would be endorsed. In a non-partisan race such as the judgeships, this is a good idea as it prevents the chance for a schism, notifies voters that, hey, this person or these people are both Dems and you can make a personal choice based on what you know, and allows for greater unity of party effort in races. Instead, what we got was a near three hour theater of the absurd caused in large part by Corbin Johnson attacking Byrd over her not having voted in Shelby County in 24 years. What she left out was that Byrd in that time has lived in Mumford and commuted in to the city in that time frame and was active in the Tipton County Democratic Party and had served as its chairwoman. If Byrd had any inkling of what was going to happen, maybe she brings that up and other allegations about Corbin Johnson that I was privy to that affected my vote. As a result, what had been an agreed up system of endorsing two people and letting the voters choose was changed to one where were forced to choose between candidates. Now, this did help a family friend (Danny Kail) and several other candidates that I personally liked more than their opposition. But that's not the point. The point is that these candidates asked for our endorsement operating under the belief that if they passed the review board, we would most likely endorse them, regardless of if someone else who is a qualified Democrat was also running. This would give the voters a choice of youth vs experience and so on. Should the party have even done this or had a more through process of vetting? Arguably no on the first and yes on the second. We had endorsed 8 years ago and no real reason not to do so now. Other members of the Exec Com who are lawyers had issues with what we did. However, if you lost the race, you wouldn't be able to blame the SCDP. You wouldn't necessarily feel acrimony towards it and would want to work with it in the future towards our goal of electing Democrats. How many of these candidates that we had promised one thing and went a completely different direction will want to help us very much in the future? Will they want to go out and help our other candidates in the August election? No, no they won't. The party exists to elect Democrats to office, first and foremost. But it also exists to build up our bench of qualified candidates for the future. It and satellite organizations such as the Young Democratic Club exist for those reasons. We should be exciting young people to embrace the party and work towards its long term success. We also should be exciting Democratic or Democrat leaning voters to get out and vote, get out and volunteer, and donate. Instead, we hurt ourselves and potentially cost ourselves some tight races. GS 7, Criminal - James Jones, Jr. If your primary votes fell in the R category, you likely were not going to get our nod (ask Mark Ward, for whom I was the ONLY EC member to vote). UPDATE: Barbara Williams has advised she voted for Mark as well, I was up front and did not turn around, so I had missed that. The issue of the night was CHANGE, which led to surprises like David Pool over incumbent John Donald and Danny Kail over Karen Webster. For more reasons than one, Juvenile Court Judge candidate Tarik Sugarmon got the biggest applause of the night, also because it was the LAST vote of the night, which he recognized, to his credit. Not, however, that his selection should have been any surprise, I was applauding, too. So, you may ask, what's your take on this? That the process worked as it was supposed to work. Do I agree with every vote? Well, perhaps not. However, as I am on the Coordinated Campaign Committee tasked with helping elect not only our County NOMINEES but these judicial endorsees as well, any differences I have will remain private. What about the Mark Ward sign in our yard? Um, you ask my wife about that; I know better than to argue with her on this subject. Besides, SHE'S not on the committee, I am! On Monday, June 2, 2014, The Carter Malone Group, LLC and Deidre Malone were notified they were named in a lawsuit filed by Christina Stevison and Stevison Group, the alleged owners of the Sisterhood Showcase. Apparently, The Carter Malone Group, LLC was named as a defendant in this lawsuit because its client, Minerva Little, the publisher of Spirit Magazine and owner of Sistahs Succeed 2, Inc., is producing a showcase event at the Memphis Cook Convention Center on June 6-7, 2014. The Carter Malone Group, LLC and Deidre Malone contend that they were wrongfully included as parties in this lawsuit and that the allegations against them are patently false. It is our belief that this lawsuit is politically motivated and designed to negatively impact Deidre Malone’s race for Shelby County Mayor. This is particularly evident because Deidre Malone was named individually in the lawsuit, although The Carter Malone Group, LLC has the contractual relationship with Minerva Little and the Sistahs Succeed 2 Showcase. Deidre Malone and The Carter Malone Group, LLC are strongly considering filing a counter-lawsuit against Ms. Stevison, Sisterhood Showcase and Grace Magazine for their abuse of the judicial system and defamation of character. All further questions from media, should be directed to attorney Robert L. J. Spence, Jr. at The Spence Law Firm, PLLC, and (901) 312-9160. In short, it's crap and an attempt to hurt Deidre's campaign. If she were trailing, this wouldn't be happening, you know what I mean? So, enough said about that. In other news, the Commercial Appeal's first African-American Metro columnist, Wendi Thomas, was moved to another position yesterday, with her final column to appear this Sunday. While she will be tasked with editing a new division regarding crime and justice in the area, it is still stunning that the newspaper of record for this metro area is silencing their major African-American voice. Mediaverse Memphis has good coverage of this here. While editor Louis Graham tried to put a good face on this, it is my opinion that this decision was made above his head, perhaps at Scripps' headquarters in Cincinnati. It is no surprise that the CA kowtows to the suburban subscribers, who hate Wendi's columns regarding the problems faced by African-Americans of ALL economic levels in this area. That the CA covers the only MSA in the US that is majority African-American and now has no major African-American columnist (no, Otis Sanford doesn't count, he's once-a-week), simply is mind-boggling. I have no doubt that Wendi, being the solid professional that she is and has been, will do a terrific job. However, the message from the CA is clear: The suburbs matter, the city of Memphis does NOT. Make of that what you will; outside of Kyle Veazey and the sports section, there seems to be less reason every day to subscribe to our major daily newspaper, and that's just damned sad.